Hello and Happy Saturday!! I hope you are having a great day. I had a chance to play with my brand new digi-set today (ok, technically I started yesterday but didn't get very far). I made this card for this week's Friday Sketchers . I used Emma the Mermaid and friends set from Fred, she said. I knew I had to have these images the minute I saw them. Emma the mermaid was colored with pearl ex powder and futuro floor wax. I just put the futuro in an aquapainter and picked up the powder and colored with it. I love the shimmer it gives and I thought it would be perfect for this little mermaid.Papers I used are chocolate chip, GP white, tempting turquoise, soft sky and a retired DP by SU. I sponged the white edges with tempting turquoise ink. The seahorse, star fish and shells come from the same digital set, I cut them out, colored with copics and applied stickles. I used them for my embellishments. I also added a couple of prima flowers with a rhinestone brad. Finished card measures approx. 4.5 x 8.25 inches. Thanks so much for vising my blog today, I hope you get a chance to create something fun today too. Oh, and if you haven't checked out this week's challenge yet over at the Digital Tuesday Challenge, be sure to do that. There are only a few days left to play along for a chance to win 3 of Dustin Pike's cute images. That mermaid and seahorse are TOO cute! I really like the color combo and the cute images. What a cute card and I love that image! tfs!!! What a cute card! Love your use of the pearl ex and the floor wax. I will have to try that! Gorgeous! SHAZAM! This is outta this world! Love her hair and fin flowing outside of the scalloped panel. Bling is perfecto!! Very cute card, love it! this card is do darling..and the colors that you chose..are fantastic... TFS! Very, very cute...love the image! How adorable and sweet! Love how you colored the mermaid! Great card Ellie! I love that set! Very pretty - love that cute seahorse! Totally adorable. 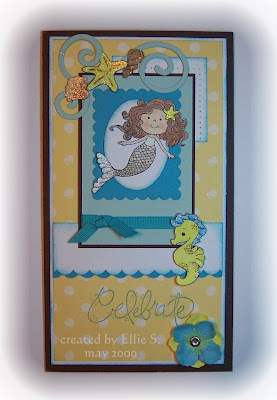 What a cute mermaid and super colors and design! Gorgeous card! The image and colour scheme are fabulous! Awesome card, Ellie! Thanks for trying out that little Mermaid :) I love your painting with Pearlex... I lurvve Pearlex!